This page is about the Soviet Lend-Lease Valentine. The British Valentine can be found here. 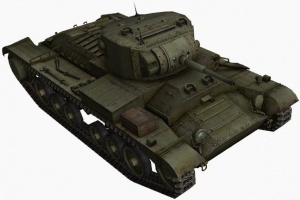 The Valentine II is a Soviet tier 4 premium light tank. Un carro británico suministrado a la URSS como parte de la Ley de Préstamo y Arriendo. Cerca de 3782 vehículos fueron enviados a la URSS con algunos perdidos en el mar durante su transporte a Múrmansk. 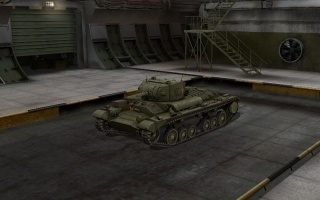 In-game the Valentine is one that was provided to the USSR through the Lend-Lease Act. It's available for purchase in the standard store and was given away as a promotion for joining the 2nd phase of closed beta. 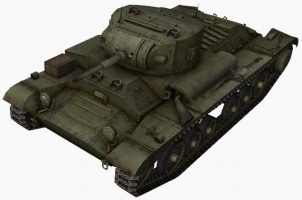 The Valentine is a another heavy tank disguised as a light, having the 2nd best armor of its tier and a shared third place with the two tier 4 French tanks for most hit points, but also the worst acceleration and top speed, superior to only the ponderous AMX 40. 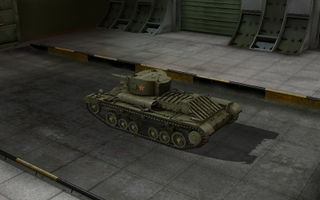 Its low horsepower is less hampered by rough terrain than most and has admirable camouflage values, being only marginally more visible than the T-50 while shooting. The jagged armor protects you from most tier 2-3 small caliber AP rounds, but only slows down the bigger guns of tank destroyers. The rear hull armor is listed as 60mm, but it only applies to the vertical "rear bumper" part - your corrugated engine compartment is much thinner in reality. You're armed with the BT-2's 45mm gun with a slightly improved accuracy, firerate and aim time that struggles to penetrate the better protected tier fours. Your AP rounds are still adequate for knocking around the tier 3 lights you encounter, but you cannot fight fair against a Lee or a Hetzer - your rate of fire is fast enough to keep a tank permanently tracked while you put every other round through a weak point in the side or rear. The tank's small dimensions help a little, but your low mobility still puts you at risk against sniping tank hunters and artillery. You can push through ordinary lights or mediums with ease, but you still can't spearhead an assault alone. Advance together, force yourself in the face of anyone trying to peek and poke at your more fragile, better-armed teammates and absorb the first hit or two while your backup tears the retreating snipers to shreds. 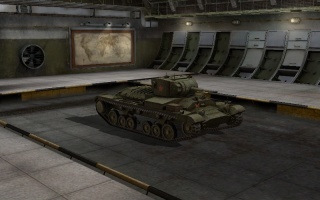 This tank is one of only 2 premium tanks (the other being the famed Pz B2) that see only tier 4 matches. 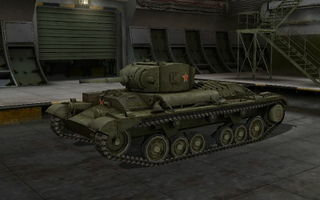 and being that the Pz B2 tend to only go up for sale rarely, the Valentine II is an excellent choice for any one who prefers Low-Mid tier gameplay, however it does need an almost excessive use of APCR rounds to be effective, but when used properly, the Valentine II can be just as effective as a Pz B2, possibly more because no one expects a Valentine II to be effective, use that to your advantage, and wreck havoc on the enemy team. There are several proposed explanations for the name Valentine. According to the most popular one, the design was presented to the War Office on St. Valentine's Day, 14 February 1940, although some sources say that the design was submitted on 10 February. 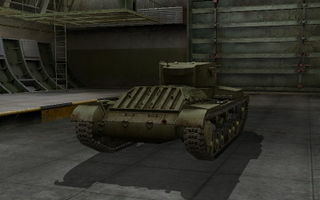 According to another version, the tank was called Valentine in honor of Sir John Valentine Carden, the man who led the development of the A10 and many other Vickers vehicles, and had died three years before. Another version says that Valentine is an acronym for Vickers-Armstrong Ltd Elswick & (Newcastle-upon) Tyne. The "most prosaic" is that it was just an in-house codeword of Vickers with no other significance. The Valentine was an infantry tank produced in the United Kingdom during the Second World War. Acounting for approximately a quarter of wartime British tank production, more than 8,000 of these tanks were produced in 11 different marks, including various purpose-built variants. Over its lifetime, it went from a riveted construction to entirely welded, and from a petrol powerplant to a two-stroke diesel engine produced by GMC, which was less likely to catch fire. It was supplied to the USSR and built under license in Canada. Developed by Vickers, it proved to be both strong and reliable. 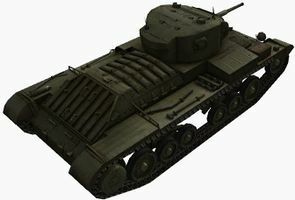 Based on the A10 Cruiser tank, the Valentine was privately designed by Vickers-Armstrongs (hence its lack of a General Staff "A" designation) and was submitted to the War Office on 10 February 1938. 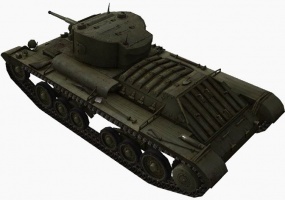 The development team tried to match the lower weight of a cruiser tank (allowing the suspension and transmission parts of the A10 heavy cruiser to be used) and coupled this with the greater armor of an infantry tank. The result is a very compact vehicle with a cramped interior and two-man turret. Its armor was weaker than the Infantry Tank II Matilda but, due to a weaker engine, the lighter tank had the same top speed. However, the new design was easier to produce and much less expensive. The War Office was initially deterred by the size of the turret, since they considered a turret crew of three necessary to free the vehicle commander from direct involvement in operating the gun. Concerned by the situation in Europe, however, it finally approved the design in April 1939. The vehicle reached trials in May 1940, which coincided with the loss of much of Britain's materiel in France during the evacuation at Dunkirk. The trials were successful and the vehicle was rushed into production as the Infantry Tank III Valentine. No pilot models were required, as much of the mechanics had been proven on the A10, and it entered service from July 1940.
image:Valentine_mkII-IWM-KID.jpg‎|Valentine In Russia The first Valentines used a petrol engine with conventional steering. The Mark II used a diesel version of the engine, and the Mark IV a GMC diesel: these were the majority of those used in the desert campaigns. Improved tracks were added and the No. 19 Wireless replaced the No. 11. The Valentine remained in production until April 1944, becoming Britain's most-produced tank during the war with 6,855 units manufactured in the UK (by Vickers, Metropolitan-Cammell Carriage and Wagon, and Birmingham Railway Carriage and Wagon), and a further 1,420 in Canada. 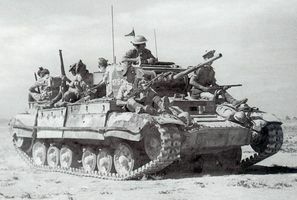 image:Valentine_Mk3_desert.jpg|VA Valentine in North Africa, carrying infantry from a Scottish regiment The tank first served in Operation Crusader in the North African desert, where it began to replace the Matilda. It was extensively used in the North African Campaign, earning a reputation as a reliable and well-protected vehicle. 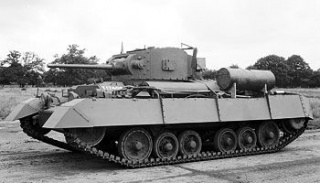 The Valentine shared the common weakness' of the British tanks of the period: its 2-pounder gun lacked high-explosive (anti-personnel) capability, and soon became outdated as an anti-tank weapon as well. The small size of the turret and turret ring made mounting larger guns a difficult task. Although versions with the 6-pounder, and then with the Ordnance QF 75 mm gun were developed, by the time they were available in significant numbers, better tanks had reached the battlefield. Another weakness was the small crew compartment and the turret for only two men. A larger turret with a loader position added was used in some of the 2-pounder versions, but the position had to be removed again in variants with larger guns. 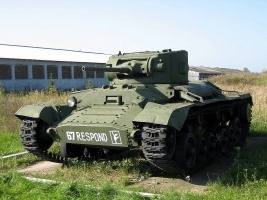 By 1944, the Valentine had been almost completely replaced in front-line units of the European Theatre by the Infantry Tank IV Churchill and the US-made Sherman. In the Pacific, the tank was employed in limited numbers at least until May 1945. It was used in New Zealand's service, some with the main armament replaced by the 3 inch howitzer taken from Australian Matilda CS tanks., on the Solomons in 1943. In Soviet service, the Valentine was used from the Battle of Moscow until the end of the war. 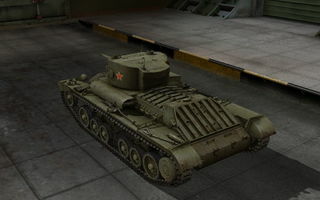 Although criticized for its low speed and weak gun, the Valentine was liked due to its small size, reliability, and generally-good armor protection. The Valentine was the Commonwealth's main export to the Soviet Union under the Lend-lease Act, with 2,394 of the British models and 1,388 of the Canadian Pacific-built models being sent: the remaining 30 being kept for training. Typically, Lend-Lease vehicles were worse than modern Soviets ones. However, at the same time, the USSR also used even more obsolete tanks and planes. The complete guide to tanks & armoured vehicles. p. 98. Esta página fue modificada por última vez el 25 oct 2016, a las 13:30.